Secure multiparty computation (MPC) on incomplete communication networks has been studied within two primary models: (1) Where a partial network is fixed a priori, and thus corruptions can occur dependent on its structure, and (2) Where edges in the communication graph are determined dynamically as part of the protocol. Whereas a rich literature has succeeded in mapping out the feasibility and limitations of graph structures supporting secure computation in the fixed-graph model (including strong classical lower bounds), these bounds do not apply in the latter dynamic-graph setting, which has recently seen exciting new results, but remains relatively unexplored. 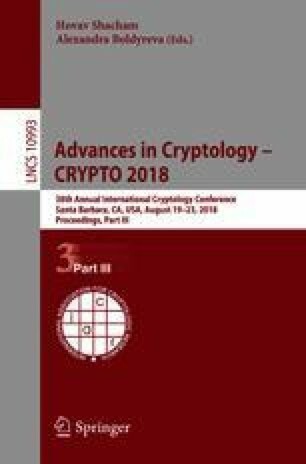 Upper bounds: We demonstrate secure protocols whose induced communication graphs are not expanders, within a wide range of settings (computational, information theoretic, with low locality, and adaptive security), each assuming some form of input-independent setup. Lower bounds: In the setting without setup and adaptive corruptions, we demonstrate that for certain functionalities, no protocol can maintain a non-expanding communication graph against all adversarial strategies. Our lower bound relies only on protocol correctness (not privacy), and requires a surprisingly delicate argument. R. Cohen—Supported in part by Alfred P. Sloan Foundation Award 996698, ISF grant 1861/16, ERC starting grant 638121, NEU Cybersecurity and Privacy Institute, and NSF TWC-1664445. R. Cohen, D. Data and P. Hubáček—This work was done in part while visiting at the FACT Center at IDC Herzliya. P. Hubáček—Supported by the project 17-09142S of GA ČR, Charles University project UNCE/SCI/004, and Charles University project PRIMUS/17/SCI/9. This work was done under financial support of the Neuron Fund for the support of science.